What's all the buzz about??? This wonderful spring/summer project to brighten up your home. 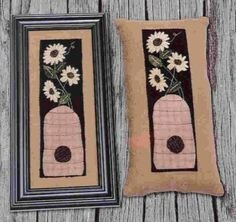 Wool applique flowers and a bee skeep do the trick. Approx. 14" x 7" when framed. Also makes a cute pillow. ( instructions included in the pattern).